In 1949, Parisian painter Henri Goetz approached Henri Sennelier, the famous artist materials manufacturer, about creating a wax color stick for his friend Pablo Picasso. Picasso, a long-time Sennelier customer and a frequent visitor to their store across the street from the Louvre museum, was looking for a medium that could be used freely on a variety of surfaces without fading or cracking. Their collaboration produced the incomparable Sennelier oil pastels. Originally available in a palette of classic hues, the color selection was expanded with the additional of metallic and iridescent hues. Beyond these classic hues, a selection of unique shades is available and, in particular, a gradation of grays, required for a balanced palette. This evolution is the fruit of a long-standing collaboration with European and North American painters who have worked with Sennelier to develop an exceptional palette of shades. The Sennelier Oil Pastel is a product that makes use of the components used in all Sennelier colors — top-quality pigments, an extremely pure synthetic binding medium, and mineral wax. The pigments are ground with an inert, non-siccative binding medium that does not oxidize and that has no effect upon either the film stability or the surface. This base is then mixed with wax (neutral pH). The balance of this mix provides Sennelier oil pastels with a unique unctuousness and a creamy texture that allows for a great deal of freedom in pictorial expression. Sennelier Oil Pastels possess an extraordinarily high pigment content, thus providing them with a high coloring and covering potential, excellent brightness, and a high degree of light stability (with the exception of metallic and fluorescent shades). 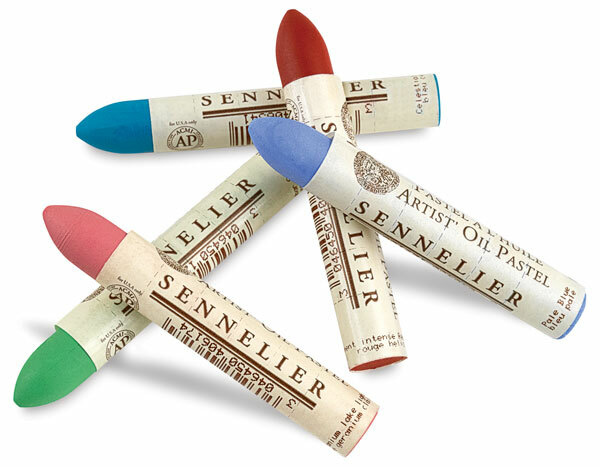 The remarkable properties of these components, along with their precise dosage, provide Sennelier Oil Pastels with unique properties, making the brand a world-recognized reference. Individual sticks are paper wrapped, and measure 2-5/8" × 3/8" (67 mm × 10 mm). Note — To protect an oil pastel surface from dirt and dust, apply a fixative 8 to 10 days after the work is completed. The fixative will not dry the work. If desired, a final varnish spray can be applied to seal the surface permanently, but this may adversely affect future restoration possibilities. Minimum Order — Please order individual pastels (open stock) in a minimum of 6, so that we can efficiently package and ship your order. Your selection may be assorted to meet this requirement. Oil pastels can be used alone to create a painting. Apply them thickly or thinly, blurred or clearly defined. They can be combined with oil painting mediums such as turpentine, paint thinner, or any of the painting oils to produce glazing, scumbling, or wash effects. Oil paints should never be used over oil pastels, because oil pastels never dry out, and oil paints will not adhere to the underlying surface. Oil paints can be used over an oil pastel wash, provided that the underlying surface is primed. Interesting effects can be achieved by scraping, scratching, smearing, or scrubbing the pastel surface. Oil pastels can be used as a resist with water-based mediums such as watercolor or acrylic. Waterbased paint will not mix with the pastel. Oil pastels can also be used with colored pencils and oil sticks. They can be used in conjunction with printmaking inks to create monotypes. Oil pastels can be applied with a palette knife to achieve impasto effects. For ease in application, the pastel can be heated or melted to obtain a smoother, more creamy or fluid medium. Recommendations for Supports — Sennelier Oil Pastels were created to free artists from technical restraints and the limitations of traditional supports such as canvas. They are extremely versatile and can be used on a wide variety of surfaces. Use them on acid-free drawing paper, at least 100–110 lb. weight, or on watercolor paper, at least 140 lb. A surface that is lightly textured, but not rough, is customary for oil pastels. Use them on museum board, illustration board, or any acid-free paperboard stock, or apply them to rigid supports such as wood, Masonite, glass, ceramics, or metal. Soft supports such as canvas, made of cotton, linen, or polyester, can also be used, as well as other natural and synthetic fabrics. Note — Although it is not absolutely required, Sennelier recommends applying a coat of gesso prior to painting on non-paper surfaces, to preserve the intensity and vibrancy of colors. Picasso, a long-time Sennelier customer, was looking for a medium that could be used freely on a variety of surfaces without fading or cracking.The collaboration between Henri Sennelier and Pablo Picasso produced the incomparable Sennelier oil pastels.